Fig. 8. 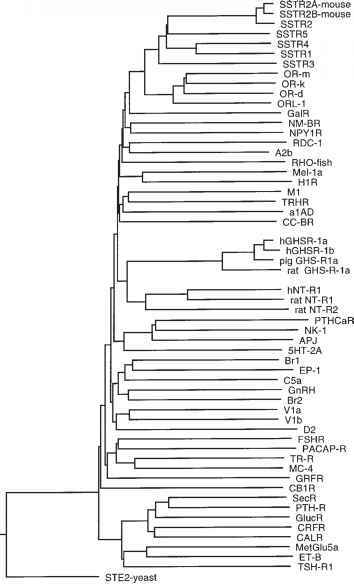 Dendrogram alignment of the GHS-R and other GPC-Rs. Database searches (Genbank 92, EMBL 43, Swiss-Prot 31, PIR 45, dEST [GBest 92], Prosite 12), sequence alignments and analysis of the GHS-R nucleotide, and protein sequences were carried out using the GCG Sequence Analysis Software Package (Madison, WI; PileUp, peptide structure and motif programs). The amino acid sequence of representative members (56 sequences) for all known classes (Families I—IV and pheromone) of GPC-Rs were used to construct the dendrogram using the clustal method (PAM-250, gap and length penalty =10). Neurosciences center); Kristine Prendergrast, Dennis Underwood (Molecular Design); Michael S. Phillips (Human Genetics); Molecular Cell Science Inc., Gwen Childs (University of Texas); Keith Elliston (Bioinformatics); and Sunil Gupta (Cellular & Molecular Biology) for their participation and invaluable input into the GHS-R program.